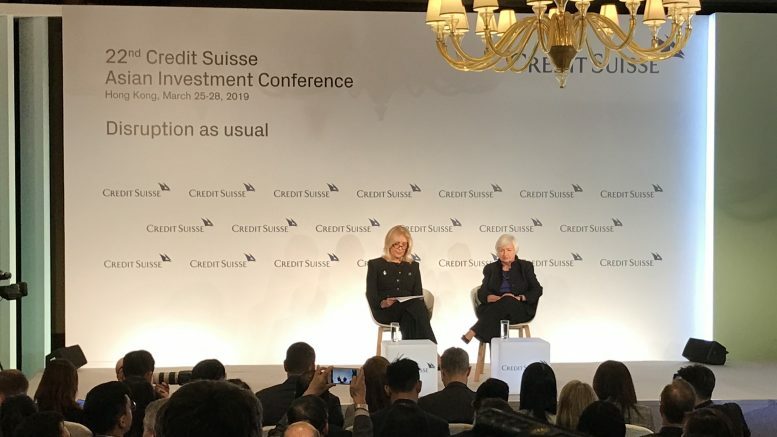 Former U.S. Federal Reserve chief Janet Yellen (right) at the Credit Suisse Asian Investment Conference in Hong Kong on 25 March 2019. The disruptions and uncertainty central bankers have been dealing with over the past few years have one root cause, said former U.S. Federal Reserve chief Janet Yellen on Monday. Yellen added that’s driving those groups in protectionist or immigration concerns, as well as creating “tremendous uncertainty” for businesses and monetary policy. Technological disruptions are also a factor, she said. She added that upcoming technology, such as artificial learning and artificial intelligence, were set to intensify pressure in the labor market.